Well done to everyone who competed yesterday in atrocious conditions in Stoke. Everybody gave outstanding performances in awful weather. We only had 2 women, but they both took 1st places in their events. Janice Pryce won the W35 Triple Jump with a distance close to her British W50 outdoor record. She also won the W50 long jump (despite the wind blowing away her check marks). Newcomer Lorna Foster, who was competing in her first ever Discus competition, took first place with a throw of 17.74m. In the M50 Discus Graham Felton (who is an M60) took 2nd place with a throw of 25.67m to set a new M60 club record with the 1.5Kg Discus. He also won the M60 200m and took 4th place in the M35 Shot. Donald Brown ran a great M40 200m to take 2nd place. Unfortunately it was not good news for newcomer Patrick Danville in the M50 200m. Having moved comfortably into 2nd place he pulled his hamstring. This was his first taste of competition since he was 16 and his training has been going well. We hope he’ll be back in action soon. After his customary drive from Cardigan David Price took 4th place in the M60 javelin competing against guys much younger than him. Bunny Kyd was like a human dynamo competing in three consecutive events, taking 2nd in the M60 3000m, 3rd in the M35 walk and 5th in the M50 800m. Richard Lewis took 3rd place in the M40 3000m on his debut. The next meeting takes place at Burton on Wednesday 26 June. Royal Sutton athletes won lots of medals at the Warwickshire County Championships at the weekend. Nicholas Pryce starred with victories in the senior men’s 100m and 200m. His times of 10.78 and 21.81 were both PB’s and new club records. Other highlights included Elmena Saunders winning the U17 800m in a PB of 2.18, and Luke Flemming winning the U20 400m. Janice Pryce set a new Warwickshire Masters record with her jump of 9.72 in the triple jump. The senior athletics team kicked off the season on Saturday with a match at Leamington. Despite having a greatly depleted team there were some fantastic individual performances. Nicholas Pryce won the 100m and 200m in style, whilst there were also victories for Kevin Brown in the discus and Nick Corker in the 2000m steeplechase. For the women Megan, Charmaine, Janice and Fiona (with a cameo performance from Hannah Jennings) worked tirelessly, competing in multiple events to pick up lots of points. The day ended with a fantastic victory for the men’s 4x400m team (Luke, Stuart, Fred and Nicholas). Many thanks to our officials – Jane, Linda, Katie and Hannah. The full results are available here. The next match is at Abingdon on 9 June. Let’s get a great team out – no excuses allowed! 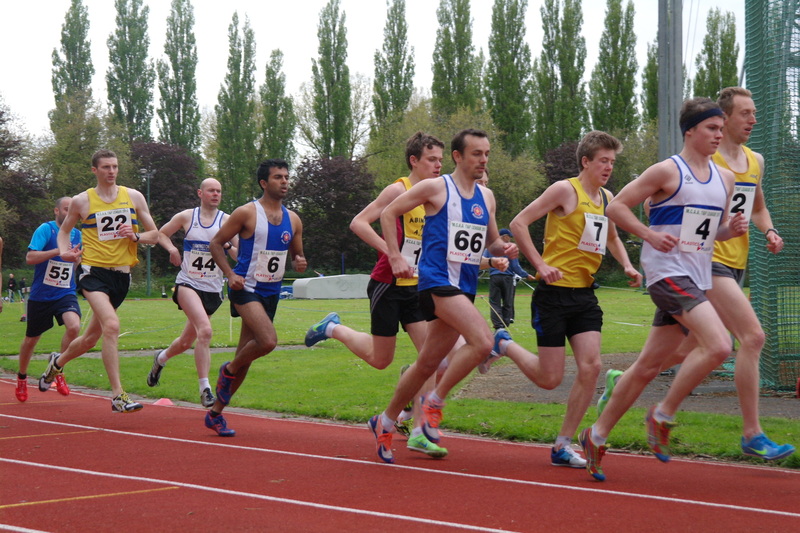 On Saturday the club competed in the British Masters Road Relays in Sutton Park. With resources stretched to the limit due to other athletes competing at the season’s first senior T&F match three teams were entered. For many of the athletes this was the first competitive outing since running the London Marathon. Despite tired legs there were some good performances and a good club turnout. The women’s 35 team provided the highlight finishing 12th with Andrea Deathridge and Kate McBrien both running very fast legs (the team was in 2nd place for some of the race!). The men’s 45 team finished 19th, whilst the men’s 35 team was one runner short. Race photos are available on Bryan Dale’s website here. The leg times are provided below.